During our Senior year it was the COOL thing to do, to quit school and join the Marines. Every Sat. night the train to Paris Island would leave at midnight. Everyone would go to the FEC station, to see off, whoever was leaving that week.The Korean war was going Hot & Heavy at that time.We used to see who would hang on to the back of the train the longest, as it was leaving the station.I was determined one night to set a new record, for hanging on the longest.Bill Logston & I were the last hangers-on, and the train was going pretty fast.I threw my car keys to my buddies, and told them to pick me up in Stuart, Florida. 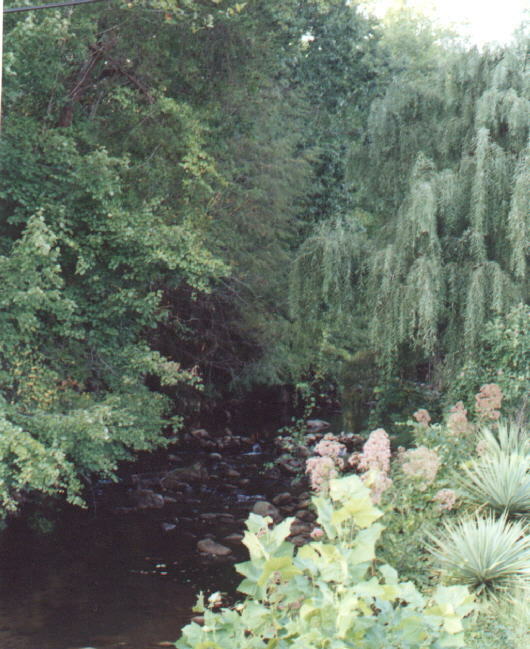 [the next stop, about 35 miles away]. It was a harrowing ride, but was worse for Bill. He was on the side between the double tracks.When we passed another train coming the other way, I thought he was a goner. We made it ok, but that ended the contest. 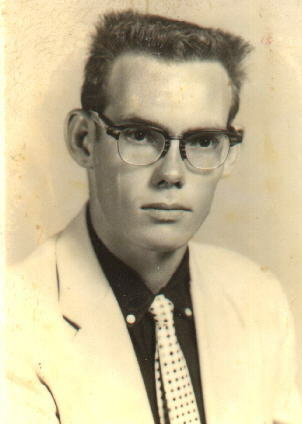 I finally graduated in 1953, then went to the University of Florida. After one year I was called to active duty by the Navy, when my draft number came up. I reported for Boot Camp at the Great Lakes Training Center, Near Chicago. From there we went to Electronics Tech. School in the same area. The school was hard and lasted 24 weeks.I was assigned to the USS Larson in Providence, Rhode Island.I reported aboard a week before Christmas, it was cold!!! 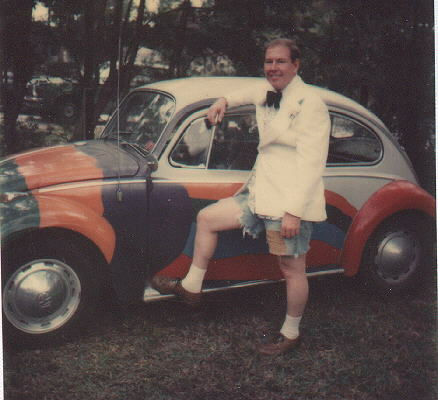 I Got Married to Pat Moree in 1954, and we bought my [our] next car. A 1947 Mercury, another gooood car. Pat had to buy it in her name, because she was 18 and I was under 21. In Illinois, a girl was legal age at 18.Here's a picture of the '47. Pat and I were together while I was in Electronics school. But she went back home to live while I was up north. I managed to swap ships with someone and got stationed in Key West,FL.on the USS Saufley. Pat joined me in Key West where we lived in a navy trailer. We were now expecting our first child.Patrice was born in 1955. 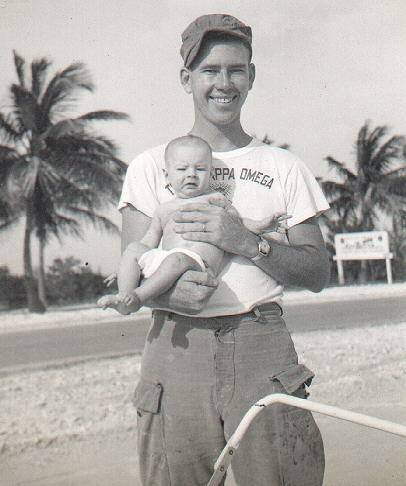 Key West was a really nice place back in the early fifties. The road [US#1]from there to Miami was almost deserted.The mosquitoes were so bad on the road that if you got out of the car, they would be so thick on you, you could not see your skin.I wish I had been blessed with a view of the future...property was real cheap back then.Bummer!! The old Merc. was burning a lot of oil now and I used to buy it by the gallon can to add along the way back and forth.About the time it was about to quit,We bought a 1955 Chevy..Our first brand new car.It cost $2,000 new and I wish I had it back today.I've had good luck with cars , seems like all my old cars turned out to be Classics. 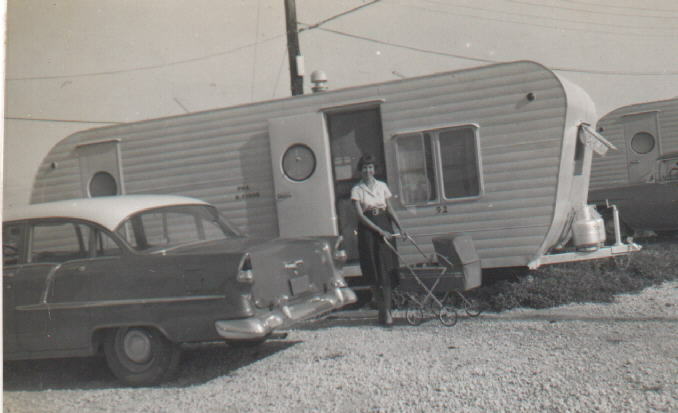 Our 1955 Chevy, in front of our Trailer in Key West, FL.1955. Pat & Patrice @ 92 Salt Pond. 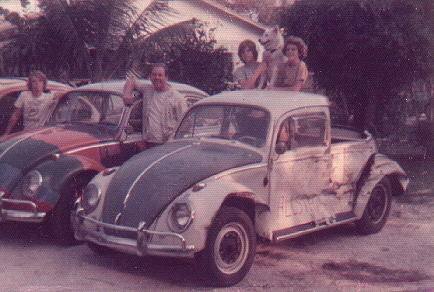 I also had some Volkswagons...1962,1963,1964...They ruined them when they went to the 12volt battery.They were a tough car, you could drive them anywhere.If the battery went dead, no problem, just stick your foot out the door and push it like a scooter...They would start right up.You could buy a used one any day in the paper for $100-$200.You could change engines like a tire..Great car. Here's a few of ours, the fancy colored one was mine for the road.The other two,were for spare parts.My two sons, Mike & Lester drove them in the yard. 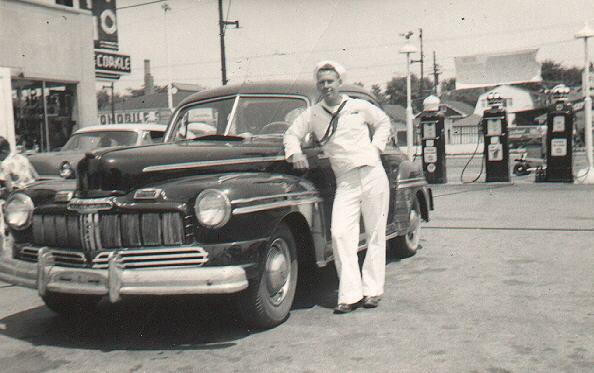 Got out of the Navy in 1956, and went to work for Ma Bell. I worked there for 30 years, in WPB. FL.We had 3 more children: Yvonne, Mike & Lester Jr.
My Dad died in 1956 and my brother died in a car wreck in 1959, his name was Buddy and he was 5 years younger than I. 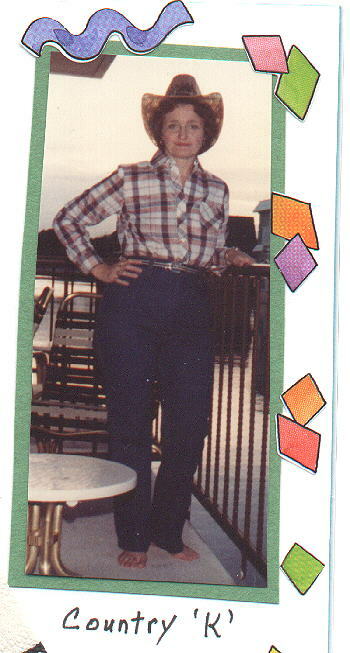 My wife Pat died in 1979 of lung cancer. Guess I'll get all the sad stuff over with in one paragraph. My Mother passed away in 1987. I met my present wife on the phone at work. She also worked for AT&T, in Atlanta,GA. We got married about a year later and have been married now for 18 years.I was really blessed to find such a wonderful person to spend the rest of my life with. I had 4 kids and Dianne also had 4, so thats how we wound up with so many children  and grandchildren .